The Big Turtle Year is a collaborative, wide-ranging project which will require the knowledge and talents of numerous partners from across the United States to ensure success. These diverse individuals work as turtle researchers, conservationists, and educators within a broad range of settings. Please browse through the biographical sketches below to learn more about our team. Additional team members will be added below as they join with our ambitious endeavor. George is a field biologist and environmental educator specializing in Florida reptiles. His company, Heinrich Ecological Services, is based in St. Petersburg, Florida, USA and conducts wildlife surveys and research, natural history programming, and nature-based tours. A graduate of Memphis State University, his interests include southeastern upland, riverine, and brackish wetland ecosystems; conservation challenges facing Florida’s non-marine turtles; and the role of education in conserving herpetofauna. Current collaborative research projects focus on three imperiled species: the gopher tortoise (Gopherus polyphemus), diamondback terrapin (Malaclemys terrapin), and Suwannee cooter (Pseudemys concinna suwanniensis). George is an invited member of the IUCN Tortoise and Freshwater Turtle Specialist Group, served twice as co-chair of the Gopher Tortoise Council, and is the executive director of the Florida Turtle Conservation Trust. He has received a number of awards from state and regional NGOs for his conservation and environmental education work, the most recent being the Golden LEEF Award for Outstanding Contribution to Florida Environmental Education from the League of Environmental Educators in Florida. From the age of ten, Tim has been actively involved in herpetology and has been fortunate to turn a childhood hobby into a rewarding career. At age twelve, Dr. Jim Layne of the Archbold Biological Station mentored him and helped guide his scientific interests. He went on to receive a degree in Zoo Animal Technology and has worked in the zoo/aquaria/museum field for twenty-three years including spending three years as Collection Manager with Dr. Peter C. H. Pritchard at the Chelonian Research Institute. Tim has been involved in a variety of projects, including Suwannee cooters, Carolina diamondback terrapins, and spotted turtles, and is an invited member of the IUCN Tortoise and Freshwater Turtle Specialist Group. Tim is an avid outdoorsman, accomplished photographer, and book collector. Later in life, Tim earned a Master's Degree in Museum Studies through the University of Leicester, England. His current position is Manager of Natural History Collections and Citizen Science with the Bruce Museum in Greenwich, Connecticut. Turtles have been in Jim's blood for as long as he can remember. Jim has extensive field experience with turtles in the northeast region of the United States. He is currently involved with conservation projects in New Jersey with wood turtles, bog turtles, and common map turtles. An avid traveler, Jim has participated in many herpetological related conservation projects in Costa Rica, South Africa, the Galapagos Islands, and in many parts of the U.S. Jim's other interests are visiting our national parks with his family, baseball, and book collecting. The Big Turtle Year is an outstanding project that will educate and raise awareness of the need to protect our North American turtles and tortoises. Jim is excited to be a part of this project! Dr. Atkinson earned a Ph.D. in Wildlife Ecology and Conservation from the University of Florida. His curiosity for reptiles began as a kid in western Pennsylvania, when he dreamed of being a paleontologist. Today, his research focuses on turtle conservation ecology – his efforts aimed at reducing human impacts to these living fossils. Dr. Atkinson has lived and worked at the Wetlands Institute in Stone Harbor, New Jersey and the Chelonian Research Institute in Oviedo, Florida, where he studied under Drs. Roger Wood and Peter Pritchard, respectively. He serves as an advisory board member for the Eastern Box Turtle Conservation Trust, and is Florida’s representative to the Diamondback Terrapin Working Group. Dr. Atkinson is now an assistant professor in the Department of Natural Sciences at Flagler College (Saint Augustine, Florida), where he enjoys taking his "Tortuga Crew" into the field to conduct turtle research. He teaches courses in environmental science, biology, marine biology, ecology, and coastal zoology. Dr. Atkinson hopes that The Big Turtle Year raises awareness and garners funds for on-the-ground conservation projects. Michael has served as an officer for a number of chelonian organizations, in addition to serving as chair of several conferences on turtles and tortoises. He has traveled to many places around the world with Dr. Peter C. H. Pritchard, perhaps the world's foremost authority on turtle and tortoise research, in the pursuit of enhancing his knowledge about threatened and endangered chelonians. Michael enjoys leading tours with groups around the world to places like Galapagos, South Africa, and Costa Rica to see turtles and tortoises in their natural environments. His passion is teaching the public, especially young people, about the importance of chelonians through various educational events which he hosts throughout the year. Michael believes that The Big Turtle Year will put a spotlight on turtles and tortoises, providing awareness and education about these wonderful creatures. He received his B.S. from UCLA, his MBA from California State Dominguez Hills, and did his doctoral studies at University of Southern California. Brian Bastarache earned an MA in Environmental Management from Harvard University and a BS in Wildlife Biology from the University of Massachusetts at Amherst. He is now the Natural Resource Management Department Chairman at the Bristol County Agricultural High School in Dighton, Massachusetts and teaches fisheries, wildlife of New England, outdoor skills, and other related courses. He also manages students engaged in several cooperative research and conservation projects, many of which focus on imperiled turtles, in partnership with universities, government agencies, consulting companies, and non-governmental organizations. Outside of the academic year, Brian is often involved with fieldwork which most recently focused on diploid blue-spotted salamanders and diamondback terrapins. Grover Brown is a Ph.D. student at The University of Southern Mississippi. His work focuses primarily on the ecology and evolutionary history of the small mud and musk turtles of the Southeastern United States. Grover graduated with a B.S. in Ecology from the Odum School of Ecology at the University of Georgia (2012). After schooling, he moved to Vietnam for a year to work with the Asian Turtle Program conducting field studies on critically endangered turtle species and to gain a better understanding of the threats facing the turtles of the region. After seeing the dire situation of turtle species in Southeast Asia, Grover had a much deeper appreciation for the diversity and abundance of turtles when he returned home to the Southeastern United States, and he understood the importance of preemptive conservation. For this, he is very supportive of The Big Turtle Year and the spotlight and platform it gives the United States’ turtle species - a country that could be argued is the last stronghold of turtle diversity and abundance in the world. Dr. Burke earned his Ph.D. in Biology from the University of Michigan, and has been a professor at Hofstra University (New York) since 1996. His main research foci have concerned the ecology, evolution, and conservation of reptiles. His current long term projects include ecological studies of diamondback terrapins in Jamaica Bay and wood turtles in northern New Jersey; he has also worked on painted turtles, eastern box turtles, snapping turtles, Herman’s tortoises, gopher tortoises, and eastern long-necked turtles. At Hofstra, Dr. Burke teaches ecology, evolution, conservation biology, and wildlife disease ecology. He co-teaches Hofstra’s biennial study abroad class on the Evolutionary Ecology and Geology of Ecuador, including the Galápagos Islands. He has an active research laboratory which involves high school students, Hofstra undergraduates, and numerous graduate students. Dr. Burke supports The Big Turtle Year because it is a great way for the public and conservationists to enjoy and appreciate turtles. Andrew has had an interest in turtles and herpetology since he was a child, sparked by nature camps taught by his friend and mentor George Heinrich. Now a high school senior, he has volunteered with numerous projects around the Tampa Bay area, such as a gopher tortoise burrow survey at Boyd Hill Nature Preserve and a study of Suwannee cooters on the Alafia River. Andrew has now become a counselor for nature camps at several preserves around Pinellas County, Florida, where he has had the opportunity to teach children (and adults) about turtle biology and ecology. Through joining this project Andrew hopes to expand his knowledge of turtles, and to raise awareness of their importance in the ecosystems of the United States and the world. A bonified card carrying turtle fanatic, Carl can trace the source of his cheloniophillic infection to when he was three years old. Fortunately, he has been able to translate that passion into a career which led him to the reptile departments of the Fort Worth and Dallas zoos and then to a curatorial and collections manager position of the Amphibian and Reptile Diversity Research Center at the University of Texas at Arlington, which he has actively worked with for 21 years. Overseeing the daily operations of a herpetological museum has allowed him the opportunity to assemble a diverse scientific collection of salvaged turtles facilitated by donations from numerous zoos and colleagues with various turtle conservation groups. Salvaging deceased turtles for perpetuity and science is an essential component in conservation. A seasoned traveler and avid outdoorsman, Carl has conducted fieldwork in Honduras, Mexico, Ecuador, Venezuela, Peru, Java, Sumatra, and extensively throughout Texas where he is still actively conducting fieldwork and is the most vocal of turtle advocates encouraging citizen science and public outreach in his beloved Lone Star State. 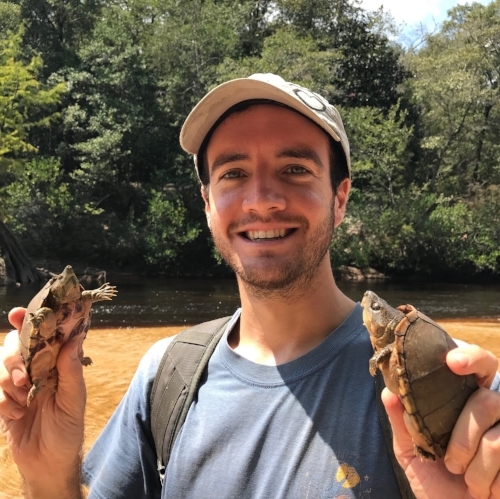 Joe currently studies the habits and status of the flattened musk turtle in Bankhead National Forest, Alabama as a graduate student under Dr. David Steen at Auburn University. He received a B.S. in Zoology and a Bachelor of Mechanical Engineering degree at Auburn University (2016). In addition to undergraduate studies, he has spent the past four years conducting field research on the flattened musk turtle and the Black Warrior waterdog salamander with the Alabama Natural Heritage Program. Joe is best described as a field herpetologist and herpetoculturist with an interest in ecology and an obsession for conservation, especially of rare and endangered species. Dr. Jerry Johnston is a professor of biology at Santa Fe College in Gainesville, Florida. He earned a B.S. at Villanova University and a Ph.D. at the University of Miami. In 2011, Dr. Johnston was awarded Florida Professor of the Year by the Association of Florida Colleges. Since 2004, he has been the leader of the Santa Fe River Turtle Project, a collaborative effort by students, citizens, and scientists to study the turtles inhabiting the Santa Fe River basin in northern Florida and to promote conservation of the Santa Fe River ecosystem. Ecological studies by Dr. Johnston’s team have revealed that each of the 11 native species in the Santa Fe River has a unique story. The Big Turtle Year project will provide a terrific opportunity for these stories to be heard. Dr. Johnston hopes the Big Turtle Year will raise awareness about the unique diversity of northern Florida’s freshwater turtles and the conservation challenges they face. Cristina’s lifelong interest in reptiles was fostered through the numerous hiking and camping trips throughout Arizona where her parents taught her that wildlife is wondrous and worthy of study. It was on one such hike when she was four years old that she encountered her first Sonoran desert tortoise – and her love for turtles was ignited. As an undergraduate in Wildlife Science at the University of Arizona, she pursued this passion when hired to radio-track Sonoran desert tortoises for a study on the effects of fire on long-lived species while completing her B.S. Armed with the critical necessity for Sonoran desert tortoise health studies, in 2001 she was awarded an Arizona Game and Fish Department Heritage Fund Grant to study the prevalence of Mycoplasma agassizii in wild and captive Sonoran desert tortoises in Arizona. This research was the focus of her Master’s thesis. In 2006, she accepted the position of Turtles Project Coordinator for the Arizona Game and Fish Department. As the state lead for the eight native turtle species in Arizona, she strives to conduct and continue scientific studies that further the knowledge of turtle survival and ecology in Arizona. Through leading five inter-agency/inter-organizational working groups, she works with other scientists to identify priority research needs that could be addressed through her own research or the Department’s Heritage Grant Program. In addition, she provides outreach and advocacy for turtles as a Southwest Partners in Amphibian and Reptile Conservation Steering Committee member, a Board member for the Desert Tortoise Council, and an active member of the Turtle Survival Alliance. Her professional goal is to maintain a position in turtle conservation and management which utilizes her knowledge, leadership, organizational skills, and enthusiasm to encourage and promote innovative ideas to assure the survival of viable populations of native turtle species throughout their range. Her strong desire to contribute to the advancement of turtle conservation continues to drive her to succeed and to accomplish her goals. Participation in The Big Turtle Year is an absolute highlight in her career, and she looks forward to the awareness of turtles this journey will share with future generations. Bob has been involved with turtles through his entire life. His first experience was a little green turtle from a five and dime store as a little boy. That love affair stayed with him through his younger years as he kept, raised, and bred several species. That passion led him into an entrepreneurial career in the pet industry. He started out in retail and after opening his 23rd store in the midwestern United States, phased into product development, custom molding, and wire fabrication where he designed many patented products for the farm, zoological, and pet industries. After building an international organization (Super Pet) with significant national market share, he sold his companies in 2005 and returned back to his roots. He has traveled in many foreign countries, observing chelonia in the Galapagos Islands, Madagascar, and Mexico. Today, he is actively involved in turtle and tortoise conservation through captive breeding, and consumer education via his involvement in numerous reptile organizations. In addition, he and his wife, Denise, are sound believers in keeping common turtles common. Over the past seven years, they have been protecting painted turtle populations in their Illinois county by countless hours of observation during the nesting season. To this date, they have released over 1,650 turtles and Bob finds it rewarding to see floating logs and vegetation filled with numerous turtles of all sizes. Bob is proud to be involved with The Big Turtle Year and states "It is an exciting extension of what we believe in as it relates to public awareness and education on the importance of turtle conservation." Chris Lechowicz is the Director of the Wildlife & Habitat Management Program and staff herpetologist at the Sanibel-Captiva Conservation Foundation (SCCF) where he has worked for the last fourteen years. Current research at SCCF include Florida box turtles (Terrapene carolina bauri), diamondback terrapins (Malaclemys terrapin), and eastern indigo snakes (Drymarchon couperi) in Pine Island Sound in southwest Florida. He has an affinity for riverine turtles, particularly map turtles (Graptemys) that he began researching in 1991. He has given numerous lectures around the country on this group of turtles and also created a natural history website (see below) in 2001 to educate others about this diverse group of North American turtles. Chris is a previous board member of the Florida Turtle Conservation Trust (FTCT) and is a member of the IUCN/SCC Tortoise and Freshwater Turtle Group Specialist Group. He is looking forward to helping FTCT researchers meet their goals with this project. Dr. Peter V. Lindeman is a professor at Edinboro University of Pennsylvania. He is an Oklahoma native with a B.S. in Zoology and a B.A. in Honors German from Eastern Illinois University (1985), an M.S. in Zoology from the University of Idaho (1988), and a Ph.D. in Environmental Biology from the University of Louisville (1997). He was previously an associate professor at Madisonville (Kentucky) Community College. Peter’s research is focused on the ecology, evolution, life history, and conservation biology of freshwater turtles, particularly the map turtles and sawbacks (Graptemys). Current research is ongoing at Presque Isle on Lake Erie in Pennsylvania (since 1999) and the Pearl and Pascagoula drainages in Mississippi and Louisiana (since 2015). Past research was conducted in Idaho, Washington, Kentucky, Mississippi, Oklahoma, Texas, Alabama, and Louisiana. He has authored more than 60 articles and The Map Turtle and Sawback Atlas: Ecology, Evolution, Distribution, and Conservation. Tamara has been fascinated with turtles ever since she can remember, beginning with observing box turtles in the midwest where she grew up. When Tamara moved to southern Alabama as an adult, she was thrilled by the state's turtle diversity. She is an active member of the North American Field Herping Association and a contributor to HERP (Herpetological Education & Research Project). Tamara has traveled over large parts of the United States to marvel at reptile and amphibian species, and observe them in their natural environments. She is a conservationist and is alarmed at the precarious status of many of our turtle species. Tamara supports any endeavor which raises awareness about these amazing creatures. She enjoys networking with other conservation-minded herp people and shared that she is grateful to have the opportunity to contribute to The Turtle Big Year in whatever way she can. Tamara's good friend, Joseph Jenkins, informed her about this project. She stated that she has known Joe long enough to realize that anything he is involved with is a stellar cause. Charlie has been involved with turtles ever since he was bitten by a snapping turtle while saving a tricolored heron that was "stuck" in a pond. Since then, he has followed George L. Heinrich on many adventures around the state of Florida, catching turtles in Rainbow River, sea turtle walks on various beaches, trapping diamondback terrapins in crab pots, and helping with educational programs, eventually leading him to become a middle school science teacher in Tampa. Charlie also does illustrations and acrylic paintings of Florida wildlife, and has illustrated several projects for the Florida Turtle Conservation Trust. Eric C. Munscher is currently a Regional Scientist with SWCA Environmental Consultants (SWCA) and is based in Pittsburgh, Pennsylvania. He obtained his B.Sc. from Pennsylvania State University (2004), and M.Sc. from the University of North Florida (2007) where he studied diamondback terrapin nesting ecology. Since 2004, Eric has acted as the lead for a freshwater turtle population monitoring program in Florida that would become the official North American Working Group for the Turtle Survival Alliance in 2010. Since that point, Eric has worked as Director of what is now called the Turtle Survival Alliance - North American Freshwater Turtle Research Group (TSA-NAFTRG). Eric has been studying freshwater turtle populations in Florida, Texas, and Pennsylvania for over 17 years. He is also a Florida Certified Gopher Tortoise Agent, and has extensive experience in wetland delineation and threatened and endangered species surveys throughout the country. Eric supports The Big Turtle Year because of a shared mission and values, and turtle conservation through professional and public collaboration. Dirk J. Stevenson is a zoologist and herpetologist with 25 years of experience working in the Coastal Plain of the southeastern United States. Most of his career has been devoted to population monitoring of reptiles and amphibians native to the longleaf pine ecosystem. His current research — as Director of the Longleaf Savannas Initiative with The Orianne Society — includes field studies of the gopher tortoise and spotted turtle. Paul has been a professor in the Department of Biology at the University of Central Oklahoma since 1995. He received his Ph.D. from the University of New Mexico where his dissertation research was on sexual selection in Galapagos lava lizards. Paul is the senior researcher of a long-term study, initiated in 1994, on the ecology of Sonoran mud turtles (Kinosternon sonoriense) in the Peloncillo Mountains, New Mexico. Paul’s other research interests include invasion ecology of geckos and fire ants in central Oklahoma, and turtle ecology in central Oklahoma. Paul supports the Big Turtle Year because turtles are unique, fascinating, and in conservation peril. Raising public awareness about turtles is an important step in turtle conservation.